Yeah, that just happened. Romain Dumas climbed behind the wheel of Volkswagen’s electric I.D. 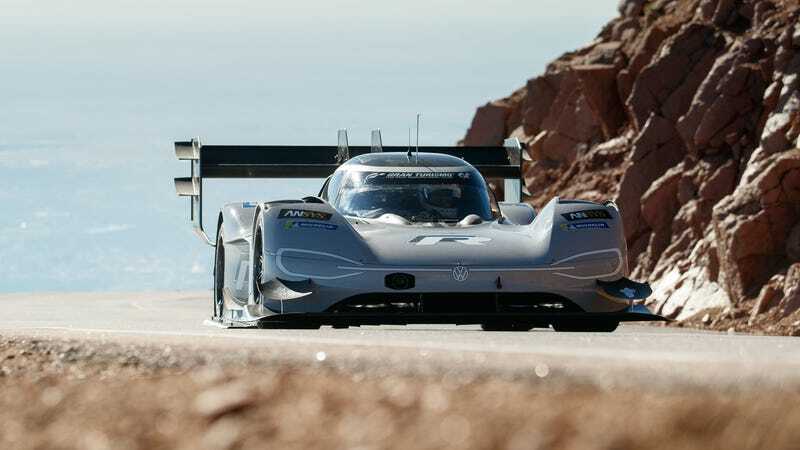 R and just beat the all-time Pikes Peak record from Sebastien Loeb by setting the first-ever time under eight minutes. Loeb’s record, a 8:13.878 set in 2013, seemed unbeatable—especially by an electric car. For a while, it’s been internal combustion engines versus an electric powertrain with the latter just considered to be slower, no matter what. But Romain Dumas and Volkswagen have just teamed up to smash down all of those preconceptions and Loeb’s record. Romain Dumas took his Volkswagen I.D. R and set a time of 7:57.148. Yeah. They just did that. That’s 12 miles and 156 curves in under eight minutes. That is an unheard of accomplishment. It’s not like we didn’t have a clue. During qualifying on Wednesday, Romain Dumas already showed that he was going to be putting up one hell of a fight to grab that record. But race day brought with it clouds and fog. The poor weather seemed like it could throw a monkey wrench into this fight, since the Volkswagen was set up for dry conditions. Turns out, none of that mattered. Loeb’s record ate dust, Dumas a full 16 seconds ahead of him. It looks like we might be ushering a new era of electric racing real soon.